The growing trend to eat healthier and live a more active lifestyle fits perfectly into Revitalize’s mission as well as the community lifestyle of the Treasure Valley. We are passionate about what we do and what we offer. It is our goal to put Meridian, ID on the map and spread the passion and love we share for healthy eating in a family atmosphere. 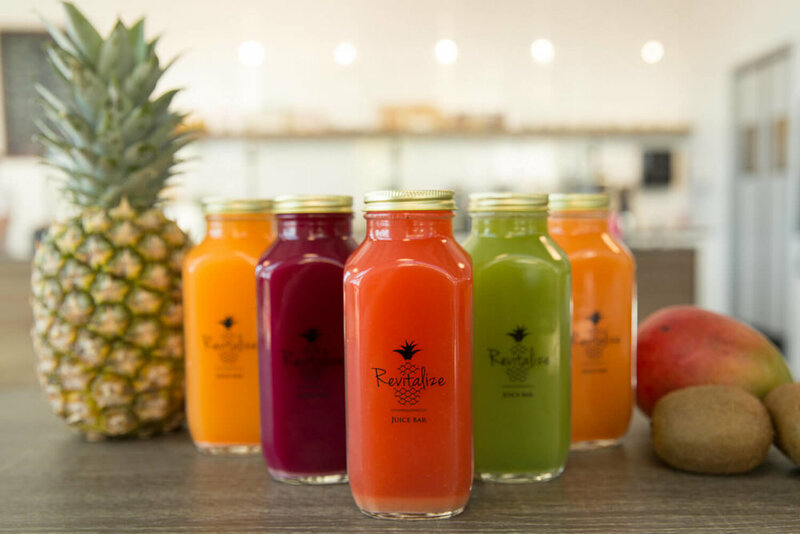 Revitalize Juice Bar is not a chain or a franchise. It is a family business with a lot of heart and soul. We want you to feel like family when you enter our doors, enjoy the hip vibe in a beautiful space and leave feeling revitalized! Organic cold pressed juice is not your typical juice. It is the most nutrient dense, highest quality and freshest juice you can consume. Thousands of pounds of pressure is applied to extract the maximum amount of liquid from the fresh fruits and veggies. There is no heat or oxygen used in the process, which means no nutrients are lost. Cold pressed juice allows you to pack in an enormous amount of vitamins and minerals that you may never otherwise consume on a daily basis. Increase your energy and enhance your immune system with a fresh, organic glass of cold pressed juice. Yes, glass, because we believe that cold pressed juice should never be consumed from plastic. We offer a recycling program at Revitalize so bring those glass bottles back! Reduce, reuse, recycle. We want Revitalize to be a place where you want to be. A place to hang out, charge your phone, meet with family and friends all while providing healthy options to fuel your body and mind in a beautiful space where you feel comfortable and welcome. 3 & 5 DAY CLEANSES REQUIRE 24-48 HR NOTICE. No Refunds on Cleanses. TURN ANY HOT DRINK INTO AN ICED DRINK!